I covered the Iraq war for Rolling Stone, and when I returned to the U.S. in 2005, I was really burnt out and my editors did not want me to go back. This was around the time that Tom Cruise was jumping up and down on Oprah's couch and speaking out about Scientology, so my editor, referring to what I'd done with the U.S. military, suggested that I do an "embed" with Scientology to find out who they really were. The church turned me down, but I started to do my own reporting and realized that this was really a parallel universe, totally self-enclosed and completely unknown to the rest of the world. I decided that I needed to approach them the way a foreign correspondent would a foreign culture. That was the only way to look at them objectively, which was my biggest goal. Yes  there are really only a handful of true "celebrities," and then maybe a hundred or so people who work behind the scenes in prominent jobs in Hollywood. 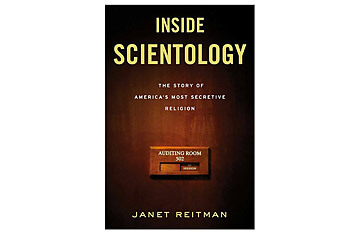 But part of the strategy, certainly since the 1990s, has been to present Scientology as a celebrity religion, although I'd say Kabbalah probably has more real celebrities. The irony is that we are a celeb-obsessed culture but also love to tear our celebrities down, and the Tom Cruise thing really backfired. She was put through such hell. They filed something like 19 lawsuits against her. When I was writing my article for Rolling Stone [which the book grew out of], Scientology officials did call the magazine and try to discredit me; that didn't work. I'm not someone who's afraid. Plus, there's so much documentation of everything I write about that it's hard to argue with. Overall, though, Scientology has an image problem, and so I think the church is conscious that they can't just sue people who try to scrutinize them anymore because they'll be seen as big litigious monsters. See "In Germany, Scientology Outrage Over a Critical Film." See TIME's top 10 celebrity meltdowns.